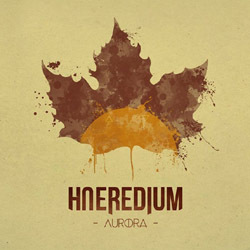 “Aurora” is the debut album of Haeredium, a new folk metal band from Alsace of Eastern France. Formed in 2009, the band worked hard trying to combine folk music and traditional instruments with heavy metal, playing at the same time in many locals gigs. Gaining a lot in experience, they recorded and completely self-produced their first full-length album “Aurora“, which was released on October 4th 2014. The first thing I need to comment about this album, is its perfect sound and professional production, many levels above the average for debut works of the genre! Haeredium play typical folk metal with clear influences from the biggest names of the genre, still managing to add something personal in their sound. Their biggest quality is the simplicity and clarity of their compositions and their unique ability to create really catchy melodies! Songs like “Mirage” simply demand the re-play button! The best way to describe their music is guitar-driven folk metal, where catchy rhythmic and melodic guitars, equally influenced by classic heavy metal and folk tunes, are combined with synths and several traditional instruments, like piano, flutes, violin, mandolin, accordion, bouzouki, melodica and Jew’s-harp. There are several parts in their compositions where folk instruments take the lead. I’d say though that Haeredium’s orchestrations are clearly metal oriented, since despite the extended use of traditional instruments, their sound is dominated by guitars. They use only clean male vocals and luckily for them Sébastien has a very beautiful and correct voice, able to sing in several folk metal styles and different languages! Their lyrics are in English, French and German, singing about nature and philosophy in general. “Aurora” lasts for almost 52 minutes, including 12 songs in a very uplifting mood, with only a few more melancholic parts. The band experiments with influences from various folklore traditions, so among others you will find elements from Celtic, Balkan and even country music! Haeredium impressed me for good and “Aurora” is one of the most promising folk metal debuts in my opinion. I surely prefer more “extreme” forms of folk metal, but I have to admit that “Aurora” is stuck in my CD-player. It’s an album I totally recommend to folk metal fans! While the band doesn’t offer something new in the genre, they do it in great style, with perfect sound and catchy melodic music! It is a completely self-released album and it comes in a nice 6-panel digipak CD, illustrated by Quentin Jaffré. You can visit their official pages below, where you can a get a taste of their music, or contact the band directly to get the album.